“Being different is becoming the norm here – something we celebrate.” Iain Clark. Steampunk Spokesman. The movement started in the USA before moving to Europe. It now encompasses fashion, crafts, music, literature and design. Conventions are held in various countries but it is Oamaru where the Steampunk movement has really found a home. You could say Oamaru is heaven for eccentrics! 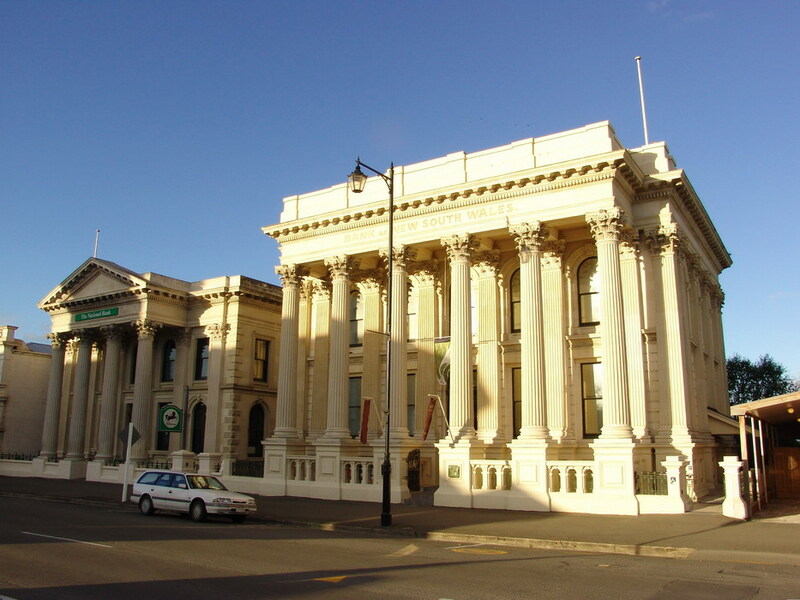 Oamaru is the capital of North Otago. With a current population of 14,000 it is a major New Zealand town and in my opinion one of the most interesting provincial towns in the whole country. When Oamaru’s port became redundant in the 1970s, the population started to decline. However, the locals turned to the fine architecture the town possesses making it the first rural centre in New Zealand to aggressively market its architectural heritage. An impressive 70 buildings in the town are of significant historic value. Because of these beautiful buildings, Omaruvians, as the folks of this town are often called, have enthusiastically taken to the idea of selling their 19th century European heritage to the world. 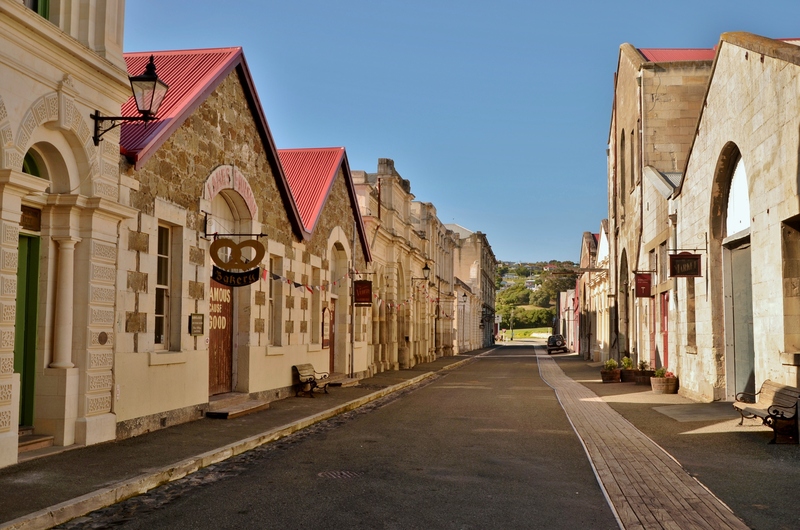 Oamaru has branded itself as “New Zealand’s Living Victorian Town”. 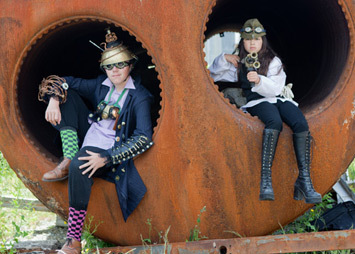 Today, Oamaru is recognised as the Australasian centre for Steampunk because it has also embraced Steampunk art and activities. The town’s abandoned industrial centre located beside the once busy wharves, has been brought back to life without altering the original appearance and atmosphere. This makes it unique in the world as there are no nearby high rise or modern buildings to spoil the Victorian/Edwardian look of the place as is the case in other preserved historic areas in overseas towns and cities. The early 20th century banks, hotels, offices and grain stores have found new life as art galleries, gift shops, artisan’s workshops, bookshops and eateries. As well as this, the locals have added a unique feature to the street: they stroll around in Victorian clothing. Even shop assistants and those operating the various workshops in the precinct dress in period clothing. When I was there, I noted the unique odours as I wandered about. There is a musty smell in the larger buildings, a result of the length of time they have stood in the moist climate that Oamaru experiences. I was also aware of the distinct odour of hessian from sacks against walls and the woody smell of sawdust on some floors. It’s all part of the period the local people have been so careful to re-create. Penny farthing bicycles frequently glide along the resurfaced road and are a popular drawcard for visitors, especially when races are held. Most of the cyclists are experienced and manage to control their ungainly vehicles as they power along the road accompanied by loud encouragement from the bystanders. Of course, those watching secretly want to see a rider come a cropper. Falling from the bike’s high seat must be somewhat amusing for those watching, not so much for the rider himself. Pedal Punk is an easier mode of pedal transport. These bikes have been designed for tourists to explore the Victorian Precinct and harbour. The four wheeled black bikes have been ‘punked’ to look the part and are a more comfortable way to pedal around the old town. To kick Oamaru’s Steampunk enterprise into action, Weta Workshop, the famous special effects company in Wellington, donated half a container load of artefacts to start a Steampunk exhibition. This was held at the Town’s Forrester Gallery in 2009 and attracted 6.000 visitors. In its second year, 11.000 people viewed the exhibition. It has been held every year since then and proved Steampunk would have a future in Oamaru. Local people initially disliked the presence of Steampunkers with their quirky appearance but once farmers around the area started visiting town and seeing some of the ‘punked’ machinery, they returned to their farms and began creating their own weird artefacts from old machinery lying about. Once the farmers had approved Steampunk, the locals saw it in a more favourable light. Although it remained divisive within the community, it made the locals more open minded. New Zealanders are great inventors and it is the ‘Kiwi thing’ to make stuff from the junk in their garden sheds so the inventive side of Steampunk is something they easily relate to and it makes sense to them. By 2010, Oamaru had embraced all things Steampunk. 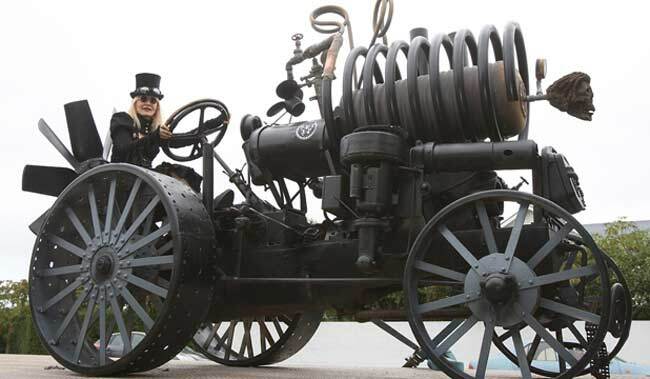 In August this year, the town entered the Guinness Book of Records for the largest gathering of Steampunks in the world. 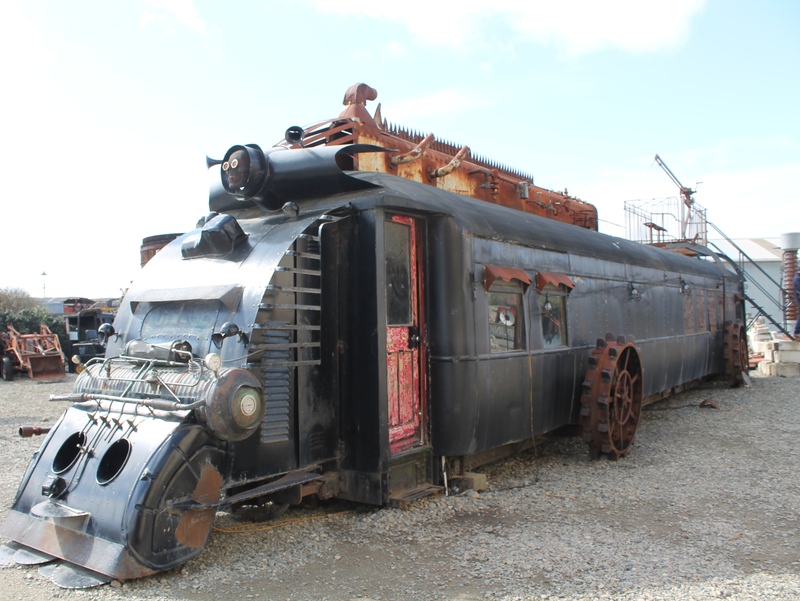 “It has been particularly freeing for the creatives and artists in the community, to have Oamaru adopt something like Steampunk as a core part of their identity,” Iain Clark, the man who brought Steampunk to Oamaru, told The Guardian Newspaper. Steampunk HQ is where all things related to this curious phenomenon are focused from the ‘punked’ train in front of the building, to the collection of curious exhibits inside. The Steampunk HQ is located in the historic grain elevator building that once used self emptying bins to store and move grain. Built in 1883, the five story building was the first elevator building in the Southern Hemisphere and is the only building of its type to survive anywhere. This makes it a valuable relic of Victorian industrial design and innovation. In 1920, a fire destroyed the top two floors so today, the building is just three stories tall. 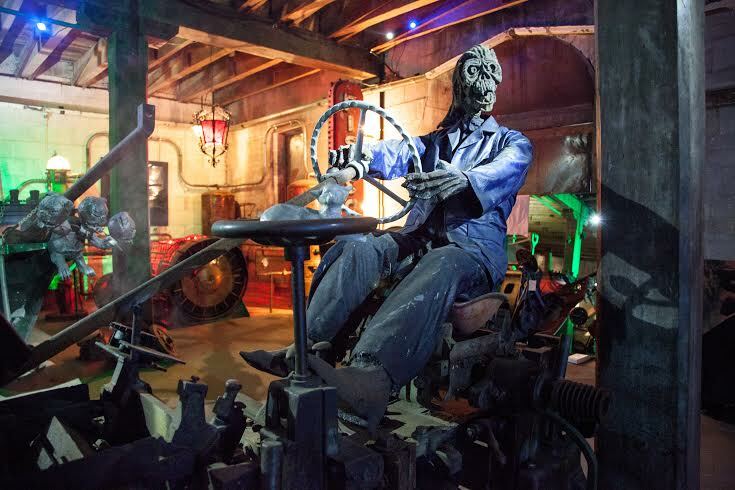 The macabre museum inside the Steampunk HQ greets visitors with grinning skulls, fantastical machines and clanking gears to establish the weird setting for a post – apocalyptic industrial gothic world. A doomsday clock ticks away above a spectral helmsman holding a pitchfork in one hand and a miniature cannon in the other hand. Across the room, a collection of dentist’s chairs reinforce the gothic nature of the place. The museum celebrates the darker side of Steampunk and proves both factions of the movement can work together in Oamaru. The frilly Victorian clothes and romantic versions of explorers favoured by mainstream Steampunkers happily sit side by side with the grimmer cyberpunk horror on display in the museum. A portal must be entered to gain access to the centre of the weird world you’ll find in this old building. 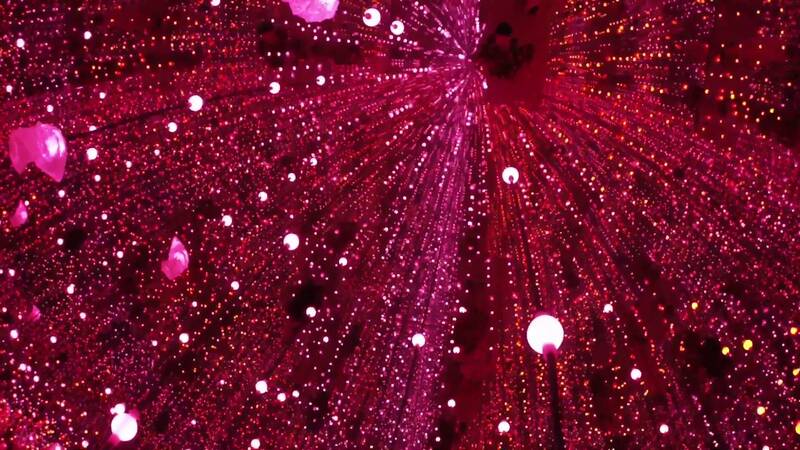 Although the exhibitions may be nightmarish, they are intended to be fun and entertaining. Outside the museum, flames leap from the chimney on top of a rusty crane which holds a macabre prisoner in a crate. There is a cannon mounted on spiky wheels. It’s like entering the world of Mad Max. 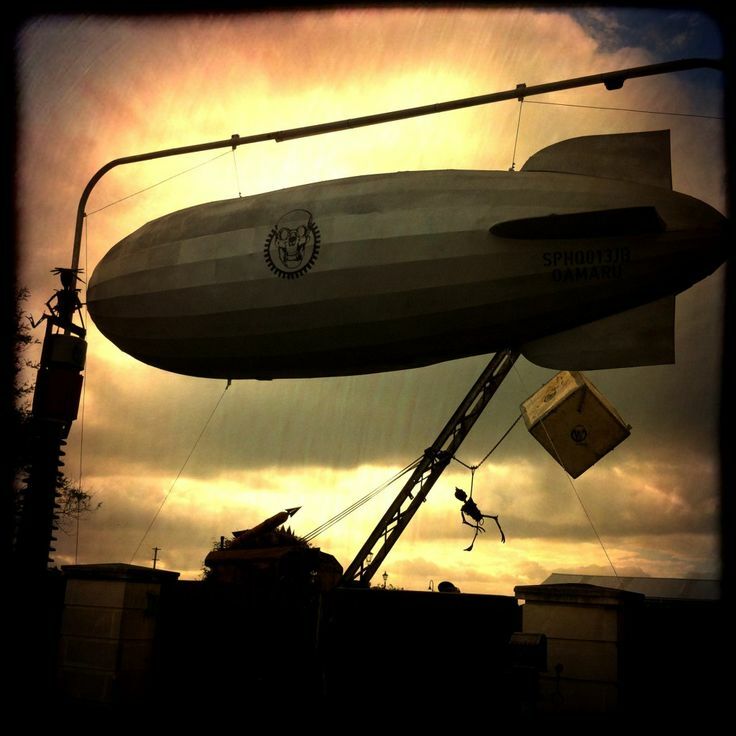 On the side of the Steasmpunk HQ building, a dirigible hovers in the air. A fisherman sits on the edge of the building’s roof with an anchor dangling from his fishing line and a group a giant metal flies claw the wall. 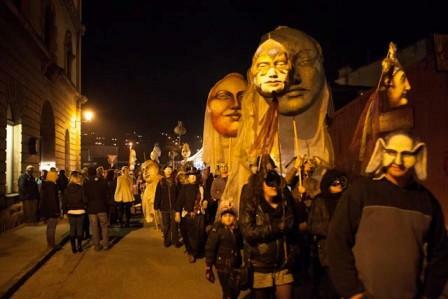 On a Friday night each June, Oamaru’s historic precinct is thronged with crowds of people wearing masquerade masks who rub shoulders with Steampunk fans in their Victorian outfits as they celebrate mid-winter. What makes this event particularly interesting is the variety of Steampunk attractions. For starters, there are races with radio controlled party balloons. A kraken hunt challenges participants to locate treasure and return it to a designated point. The rules are somewhat complicated but only add to the excitement. Along with the fireworks lighting up the sky, steam-powered plasma ray guns add a different kind of firepower among the crowd. 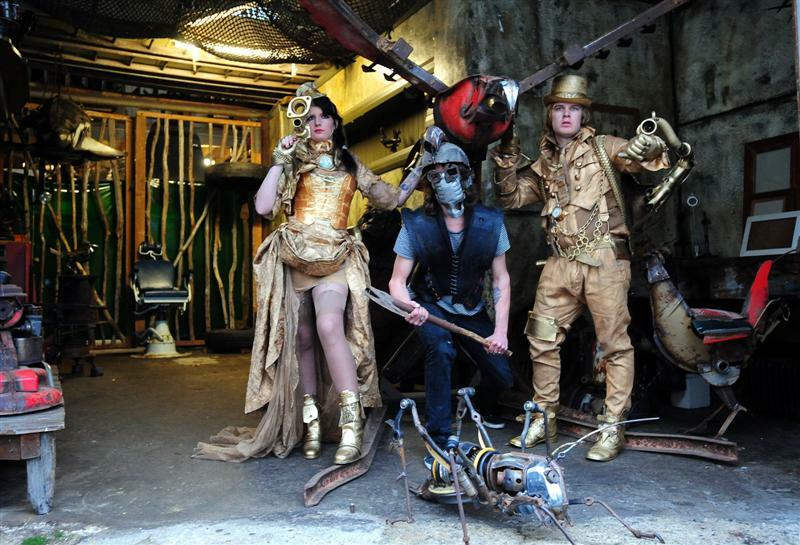 The Steampunk fashion show is the highlight of the Oamaru On Fire festival. 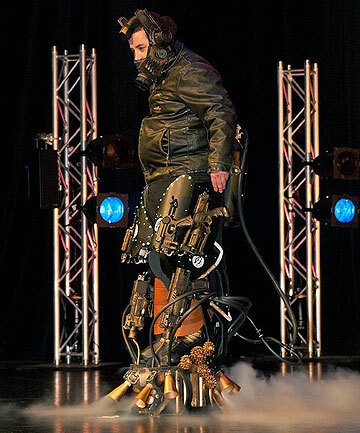 The show features scientist-inventor and adventure-explorer categories, along with evening and working wear sections. Some of the elaborate costumes take hundreds of hours to create and each is presented with a dramatic back-story. The Steampunk game of teapot racing was invented in Oamaru and has been adopted by Steampunk groups the world over. The race involves teapots carried on radio controlled vehicles that must negotiate a series of obstacles to arrive at the finish line. It is a suitably silly thing to do for a Steampunker. 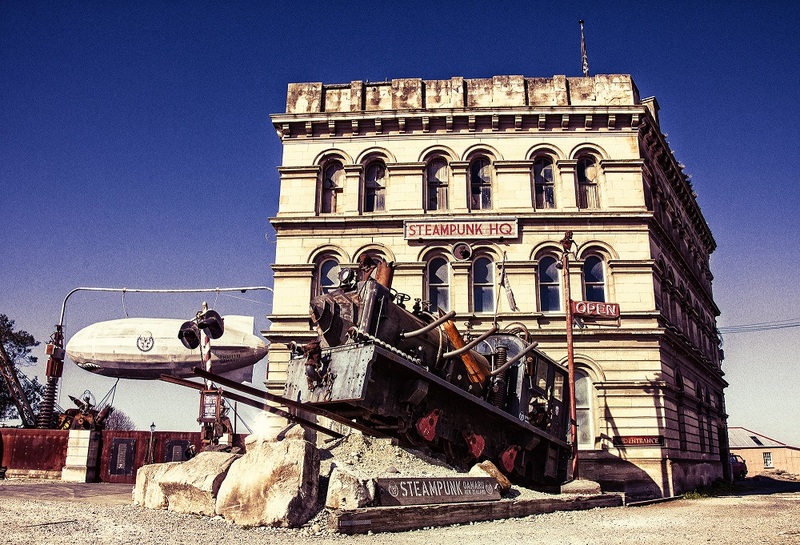 Oamaru has become such an exciting place for all things Steampunk that a number of Victorian enthusiasts have moved to the town specifically to be closer to the thriving scene. Here is a collection of Steampunk aficionados from mild to wild. If you enjoyed this blog, please share it and leave a comment. Don’t forget to check the archive page for past blogs to read.